Do dogs eat their puppies? 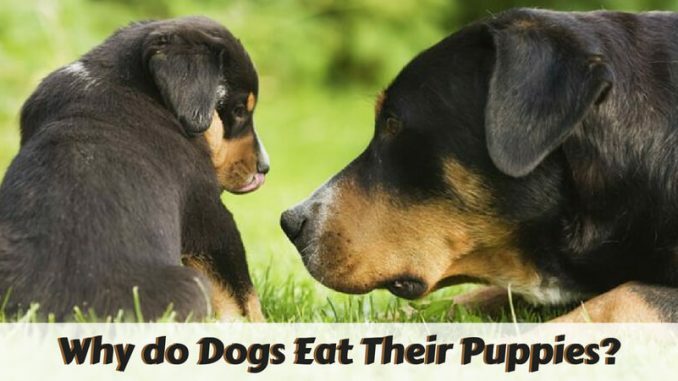 Won’t it sounds shocking for the pet owners and dog breeders when they come to know mother dog eats puppies? It happens but not in a widespread way. Pups can die due to lots of reasons like circulation or respiratory problems, infections or mastitis. But at times, the female pet is responsible for the death of puppies. Here I will discuss in detail regarding why do dogs eat their puppies? But before making you understand the reasons of mother dog eating their puppies, I will make you familiar with the term cannibalism. If you find that the animal is eating another animal of the same specie, then it is known as cannibalism. In dogs, the cannibalism is uncommon mainly if the birth takes place in the house environment. In loud or crowded kennel the cannibalism may occur at the time of delivery or maybe after few days of life. The cannibalism can be of pure or mix breed in which female dog eat pups. It may or may not considered an inherited trait and it may or may not pass from one litter to the another. There are following reasons due to which mother dog can eat their puppies. Sometimes the female dogs are unable to identify their little pups when they undergo C-sections to deliver puppies. In this condition, the hormones are not released from the mother’s body at the time of giving birth to the little furballs. The noise and erratic movements irritate the mother dog, so maybe she won’t allow them to feed. This also makes her puppies foodless for a longer time. Her predator instinct gets activated which in turn results in the eating of the helpless pups. At times it has been observed that after a delay the hormones kick in even when the mother dog experiences a natural birth. If the female dog is inexperienced, then she kills the whole animal group before they kick in. The innocent pups get killed when the mother dog is suffering from stress. The stress develops when she finds that quiet and secluded place is missing for her newborn puppies to live or she experiences that litter is too big to look after. If the female dog is bred at very young age, then during her first heat the breeding may take place, or she may act as the unstable mother. In such situations, the birth of more puppies are disallowed, so she-dog is spayed. The mother dog catches the notorious pups. During the first week of the birth, the animals depend entirely on their mother so moms should not pick them in the early stage as it may cause the death of the little pups. The ill animal can risk the life of the other puppies, so the mom of the puppies put away the unhealthy puppy from the den. The mother dog can kill the sick puppies if strong instinct comes to her mind. She can kill both ill or stillborn pups. It is the type of discomfort in which the teat of the mother dog suffers from some infection. If the puppies start sucking, then the mother dog feels a lot of pain, so she rejects the little ones. If the pain is severe, then she may turn aggressive which in turn results in killing or cannibalism of innocent pups. All these are the main factors due to which mother dog eat her puppies. Why do animals eat their placenta? It is believed that dogs possess the natural instinct to eat placenta due to the presence of high levels of prostaglandins which helps the uterus to come to pre-gestation size and provoke the cleanout process. At the time of birth, the significant amount of energy is used which is found due to the presence of the protein. The trace of the delivery can be hidden due to which no predators can be attracted, and the den area will be free from bacteria. When we come to know that mother dog has eaten her innocent pups, then we get airy or disturb which is quite natural. From this post, you can make out the reason behind the killing of the puppies by mother dog. Sometimes the pups die the natural death after birth and at times the mother dog kill their little ones due to inexperience, unstable attitude, unwell puppies, stress and mastitis.